The Huawei Watch is just the first smartwatch released by Huawei and it was released in a difficult period for smartwatch market. Surprisingly, Huawei decided to produce a premium product and this was proved to be a smart decision. The Huawei Watch is now the best Android Wear smartwatch in 2016 so far. I received the watch from Huawei but I held off reviewing it until now because I wanted to wait for the new Android Wear 1.4 update which was released in March 2016. Now, let’s take a look at the smartwatch. The Huawei Watch is so different to smartwatches I’ve tried before. It features a classic design of luxury watches with a stylish fully circular face protected by sapphire crystal. The material is scratch-resistant and more durable than Gorilla Glass used on most high-end smartphones. Moreover, there are a variety of color and strap combinations, including stainless – leather, stainless – mesh, stainless – links, black – links, rose gold – leather, rose gold – links, rose gold – elegant and rose gold – jewel. My watch is the black stainless steel with black stainless steel link band and it looks stunning. Another nice design element is the power button placement, the button is put at the 2 o’clock position so that it won’t hurt when you bend your wrist or do some push-ups. I tried the Apple Watch as well as the LG Watch Urbane but none of them has the same comfort. Besides, it is IP67 certified for dust and water resistant. 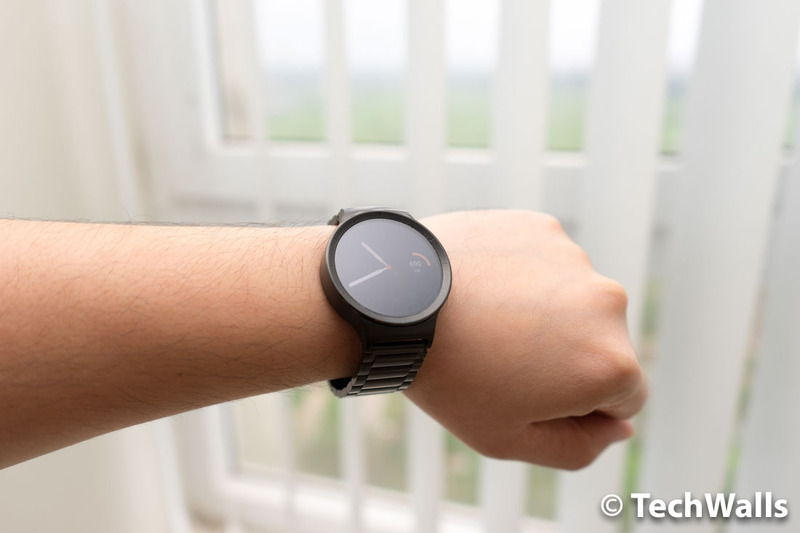 The watch feels great on my wrist and it is absolutely the premium Android smartwatch that I’ve always looked for. Inside the box, you can find the watch, a band link removal tool, a magnetic charging cradle and an AC adapter. The box is made of high-quality materials and I can see Huawei’s desire to change their brand image in this product, every detail is taken care of deliberately to provide the best user experience. The watch didn’t fit my hand out of the box, but I could easily adjust the band link with the included tool. The Huawei Watch is also built with respectable hardware. The AMOLED display has a high resolution of 400 x 400 pixels, it looks so sharp and vibrant that many people think it’s a traditional, analogue watch. The only drawback is that there is no ambient light sensor, so you will have to change brightness manually. This is not really a big issue anyway because I often set brightness at level 4 and can see everything well in the dark as well as under direct sunlight. The watch is equipped with some important sensors like gyroscope, accelerometer, barometer and a heart rate monitor. Therefore, you can use it as a fitness tracking wearable. Unfortunately, there is no on-board GPS like the Sony Smartwatch 3, so it can only track basic activities when you move your hands. You will need to bring your phone if you want to navigate on Maps or track your cycling routes. I successfully paired the watch with both iPhone 6S Plus and Samsung Galaxy S6 but I used it with the Android phone most of the time. As you can expect from an Android Wear watch, you can see notifications on the display, and most importantly, give voice commands without touching the watch. After the latest Android Wear 1.4 update, we all will benefit from the device’s built-in speaker. This means we can place and receive calls as long as the watch is paired to their phones via Bluetooth. The speaker will also play sounds within apps and alarms. At the time of writing this article, just the Huawei Watch and ASUS ZenWatch 2 have this feature. Besides, you can also send messages with voice in apps like WhatsApp, WeChat, Viber, Telegram, or Nextplus. As a fitness tracker, Huawei adds two more apps, which are the Fitness Tracking App and Daily Tracking App. Those apps are good and seem to be more accurate, however, I still prefer the Google Fit app because all data is saved when I move to another smartwatch and it syncs with third-party apps like Strava, Runkeeper or Endomondo. The device is powered by a 1.2 GHz Snapdragon 400 and 512MB RAM. It manages to run smoothly most of the time but I still experience lags occasionally. The battery life of the Huawei Watch is exactly like the manufacturer stated. The 300mAh battery often lasts just over a day for my average use. However, if you play music or make a lot of phone calls during the day, make sure to bring the charger. If you leave the watch idle, it even can last up to 3 days. 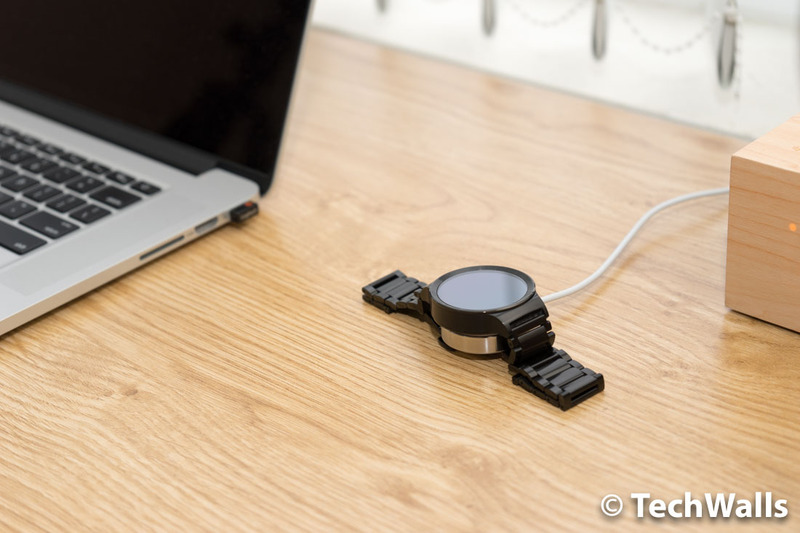 A great advantage is the convenient charging cradle, I just need to rest the watch on top of the cradle and the Huawei Watch is fully charged after just 1 hour. The Huawei Watch is not a perfect choice but it is the best Android Wear watch at the moment. I find that it has a lot of improvements after recent updates, and I use it even more often because I can make and receive phone calls without touching my phone and the smartwatch.